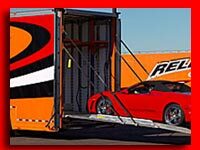 Most of our cars are purchased throughout the Southern States of the USA, and shipped by Auto Transport to our location in Clearwater, Florida. They receive a brief Road Test and a Check for any parts that we feel the car might need. Since most of the cars we purchase are already restored, they are usually ready for pictures the day they arrive. After our automobiles are photographed for our Website, they are moved to to our secure and modern Warehouse. They remain in the warehouse, protected from the elements, until they are adopted by a new owner. When one of our cars is sold and paid for, it is scheduled through our complete and State of the Art Service Facility. 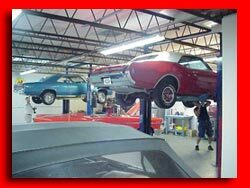 Our experienced mechanics examine the car from top to bottom and perform any necessary repairs or improvements. Since most of our automobiles are shipped Out of State, our mechanics try to make sure they will pass even the most rigid State Inspections. After all necessary service work is finished, the automobile will move to our Detail Department. 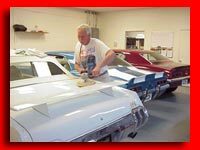 Here each car receives a Complete Detailing inside and out, including a Wet Sand and Buffing if necessary. It does not leave this area until the Manager of that department feels it is ready to deliver to its new home. Once ready for delivery, the car is moved to a Holding Area, where it is stored under a protective cover until the day the Enclosed Classic Car Transporter arrives to deliver another Beautiful Collector Vehicle to its new home. Just prior to when the Enclosed Transport arrives to pick-up the automobile, it receives a final check and detail. It is then loaded into an enclosed, secure, and fully insured Classic Car Transporter, where it begins it's journey to your home. All that is left is to have your friends and family gather to Welcome your "New Baby" to it's New Home!! 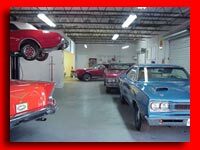 We feel that Golden Classics of Clearwater has the Most Experienced and Friendly Staff of any Classic and Muscle Car Dealership in the Country. Our Office, Sales, Service and Detail Staff are second to none in Experience, Ability, and Dedication. Aywhere!! 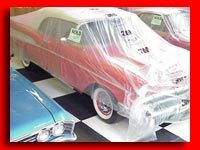 We have developed such a following, that over 90% of our cars are shipped Sight- Unseen throughout the USA and Canada, as well as to many Repeat Customers in Australia, New Zealand, South America, and much of Europe. Contact us Now, and let Golden Classics of Clearwater, Florida, Make your Dreams a Reality!!! 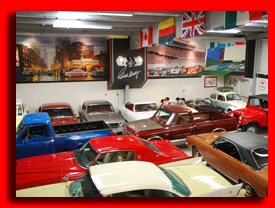 Classic Cars, Muscle Cars, Antique Cars, Collector Cars, and Foreign & Exotic Autos for collectors worldwide.